Part 1980s and 1990s nostalgia, part exuberant storytelling, I'm So Fine: A List of Famous Men & What I Had On turns a sharply humorous magnifying glass onto gendered interactions in daily life, framed primarily by random celebrity encounters in Los Angeles. Far from a narrative of fame-chasing or conceit, however, I'm So Fine breathlessly addresses what it means for a woman to fight for dignity and survival in an often hostile environment, to come into her own power as she decides what she wants for herself "& mostly gets its every fineness." 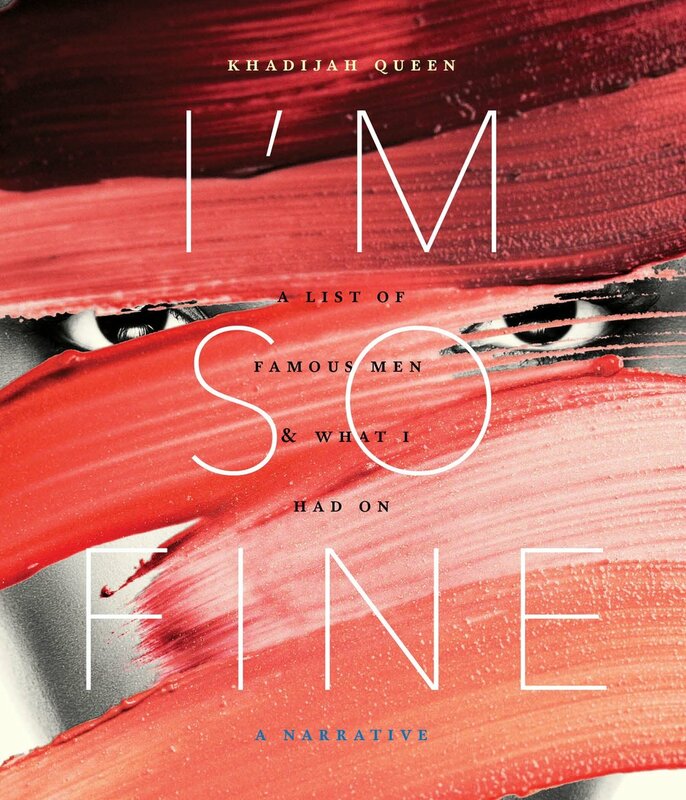 Khadijah Queen’s fearless new collection, I’m So Fine: A List of Famous Men & What I Had On, is equal parts illuminating and disconcerting, much like the celebrity cultures and patriarchal systems the book critiques. These always stylish, quick-witted pieces serve as a pop culture archive—of almost forgotten R&B singers and A-list movie stars, rappers and comedians—while breaking down fame in all of its glittery, corporation-supported entitlement. By offering us a sophisticated new lens through which we might view self-actualization, Queen reframes our understandings of gender and notoriety. I’m So Fine is an accumulation of the speaker’s seeming “chance” encounters with men, until K. Queen unzips these “chance” meetings to their bones exposing this: there is no “chance” no “un-intention” no “misunderstanding” when it comes to the language and gestures men are forever devising and revising against the female body’s sexualities and desires. This is an accumulation that is the feminine memory, that has had enough, that has disengaged from the old to create a new layering: the lines unbroken, the endless making as sweet as being out of the order other people like to think you are born to. This book is strength, is a critique, is subversive, is a woman, a fist, an lol, an F. U., a refusal, a gaze back at the gaze, is inevitable freedom wearing a flowered dress Kente cloth bomber jacket red lipstick white jeans a velvet choker white platform sandals a black turtleneck electric blue column dress an eggshell blouse with a high collar & pearl buttons is wearing a powerful woman’s body and mind. Click here for links to selected cultural references from the book!